To mark the opening of ‘Taste and Essence: Chinese and Western Historical Tea Pieces’ at the Macao Museum of Art, Tessa Murdoch gave the following speech about the UK’s long-standing fascination with tea and tea-drinking. The Victoria and Albert Museum is honoured to collaborate with the Macao Museum of Art and the Palace Museum in the exhibition ‘Taste and Essence: Chinese and Western Historical Tea Pieces’. The 48 artworks from London illustrate the context and interplay of Chinese and European tea cultures. In Lisbon, Portugal, tea was known by its Canton and Macao name ‘cha’ from about 1550. The word ‘tea’ is mentioned by William Shakespeare writing in London in about 1600. Tea was first served in London in 1652 in a public coffee house. In 1660 the diarist Samuel Pepys sent for a cup of tea, ‘a China drink of which I had never drunk before’. In 1662 the English King Charles II welcomed his Portuguese bride, Catherine of Braganza; on her arrival by sea at Portsmouth on the English south coast, she asked for a refreshing cup of tea, but it was not available so she was given ale, a light beer, instead. Europeans in the 16th and 17th centuries did not understand how tea was grown, prepared or blended in China (as illustrated in the late 18th-century album of Chinese watercolours from Guangzhou). They knew that tea came from Canton and was imported through the British East India Company. That established monopoly was challenged by the Dutch, French and Portuguese. Tea importation was ballasted by heavier Chinese porcelain; for every 100 tons of tea, 6 per cent by weight of porcelain was imported. Every year over 5 million pieces of Chinese porcelain were imported into Europe. It was cheaper and better than European porcelain, first made at the Meissen factory in present-day Germany from 1711. The Meissen plate and cup illustrated on the beautiful exhibition poster were bequeathed to the V&A by a Mrs Cameron, not a relation of Britain’s present prime minister! The English believed that the Chinese made tea in a kettle. 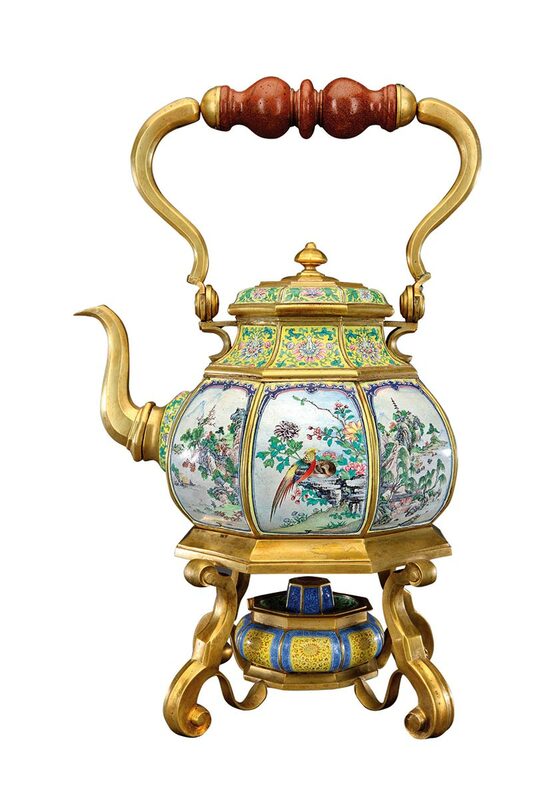 The earliest English teapots were known as ‘kettles’ or ‘boylers’. The beautiful example by Paul de Lamerie from the Rosalinde and Arthur Gilbert Collection is the highlight central exhibit amongst the V&A loans. Tea was mixed with sugar and a flavouring of bergamot, orange, lemon or verbena, and brewed in the kettle before serving. Later the English tea ceremony came to use a smaller teapot which copied the Chinese ceramic wine pot. The 12 examples from the V&A in stoneware and porcelain were made in Dehua, Yixing and Jingdezhen, China and in London, Staffordshire and Worcester. 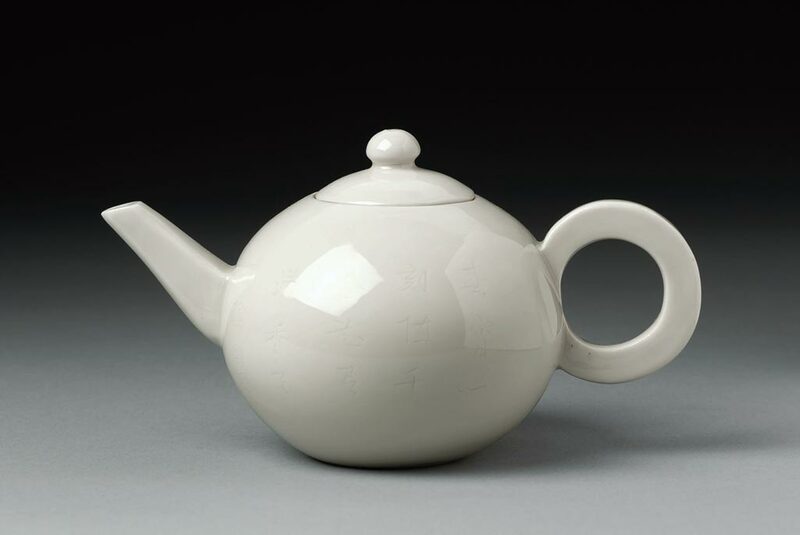 The ‘caneware’ teapot supplied by Josiah Wedgwood in the late 18th century imitates Chinese bamboo canes. In England tea was served with sugar and milk. Sugar and tea were kept in locked containers for which the lady of the house kept the key as they were expensive luxuries. The late 18th-century painting of a tea service on a tray shows matching silver canisters, one for tea, the other for lumps of sugar. Milk might be served in a cow-shaped silver jug, a memorable exhibit. These fashionable vessels reflect social status. The novelty of tea drinking in 1660s London had become a national habit one hundred years later, when all social classes drank tea in their own homes. Even today, Britain is the world’s largest importer of tea. We believe that this exhibition will offer visitors from Macao, art lovers and connoisseurs of tea, an understanding of tea culture in the Western world. On behalf of the Victoria and Albert Museum. I would like to express my heartfelt gratitude to the Macao Museum of Art, their director and their staff and to congratulate them on a beautiful installation. ‘Taste and Essence: Chinese and Western Historical Tea Pieces’ is at the Macao Museum of Art until 9 March 2014.